A sweet girl with a sweet face, Flora has spent much of her childhood being dressed as a doll. Standing at a mere four feet, four inches tall, Flora wishes for nothing more to reach her mother's height one day (which will, much to her displeasure, involve growing an entire foot over the next six or seven years). If she's feeling particularly bratty, she might tease her brother that she may one day reach him in height! She has the same dark hair shared by the other members of her immediate family, though has light eyes that different from her parents'. She has an eye for pretty dresses and enjoys "impressing" others by identifying fabrics and specific shades of colors. She writes and will presumably wield her wand with her right hand. Sensible. Loyal. Friendly. Playful. Blunt. Judgmental. Socially-conscious. Uppity. Practical. Diplomatic. Thinker. Resourceful. Unwilling to break the mold. Ravenclaw intentions with a Slytherin attitude. ❧ Despite possessing strong reading and writing skills, she hardly reads for fun. ❧ Like other well-bred girls her age, Flora speaks fluent English and French. ❧ She has a love of fashion that's likely to grow into an obsession as she ages. 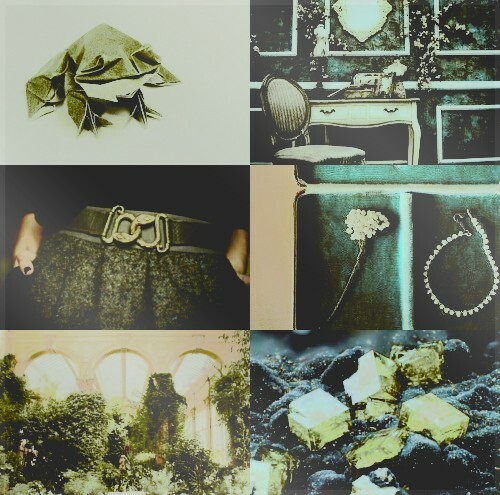 ❧ Her Hogwarts companion is a pet toad named Mr. Afton. She thinks it is male—it is not. ❧ Apart from her core classes, Flora will take Art and Music class (specifically in choir). 1877 | Flora Mulciber is born the first child of the union between Ernest and Rufina Mulciber. Though generally easygoing by infant standards, Flora frequently demands her mother's attention when in her presence. She soaks up attention given to her by her mother and brother, but hardly sees her father. 1879 | At the young age of two, Flora is blissfully unaware of her mother's miscarriages. 1880 | When Auntie Marcella marries, Flora has little understanding of the impact it has on her financial and social situation. Even at an older age, she continues to care very little because family is family. 1881 | The Mulcibers are off to New York for the holidays! Flora's young age ensures that her memories of the time are far and few between, but she's always reassured that she enjoyed herself very much. 1882 | Flora remains naive—along with literally everyone else in the family—when her Auntie Gladys gives birth to her half-brother, Rufus Wilde. September sees Merriweather departing for his first year of Hogwarts, leaving a very somber Flora lounging around the family's home for weeks. 1884 | Death! Doom! Plague! Flora's living situation changes drastically (in her opinion) when Auntie Gladys and her husband die, leaving Rufus Wilde in the care of her parents. Though still very much her mother's baby, his first few weeks in their home see Flora struggling to hide her jealousy. 1886 | A first sign of magic appears, albeit a little later than she'd have liked! 1887 | While the rest of the magical world goes to hell, Flora is enjoying her time playing in her bedroom, pestering her mother for a chance to visit the House of Lytton in London, and trying on the prettiest of dresses! Her Hogwarts days are growing nearer, and she takes plenty of time to consider her future—her house, her classes, and what pet she'll be begging for come the next summer. Summer, 1888 | The Mulciber family escape to the Sanditon in the wake of the fog, but not before being involved in the death of Georgia Whitledge by way of vehicular manslaughter. The situation puts a damper on her summer plans, but that does not stop her from pestering everyone about preparing for the upcoming school year. She purchases her school supplies—including her wand!—in July, and then the fog lifts at the beginning of August, allowing her to return home. Autumn, 1888 | Flora goes off to Hogwarts and is sorted into Slytherin (sorry, Merriweather!). ❧ Her father, Ernest Mulciber, is the assistant head of the Department of Mysteries. ❧ Her mother is a famous socialite. ❧ Her brother has always been a sickly child. ❧ Rufus Wilde, aka the Flora's cousin/her parents' ward, is actually her half-brother. ❧ She, along with her mother and brother, were involved in the murder of Georgia Whitledge by way of vehicular manslaughter.